Van Tharp, "Super Trader: Make Consistent Profits in Good and Bad Markets"
How do you transform yourself from mild-mannered investor to Super Trader? Think clearly. Plan accordingly. Commit completely. In other words, become a trader. And no one is better suited to help you make the transformation than legendary trading educator and author Van K. Tharp. Combining the sharp insight and technical brilliance that has drawn legions of investors to his books and seminars, Tharp provides a holistic approach for becoming a successful full-time trader. His system—a meld of investing psychology and sound trading practice—is the secret to achieving optimum conditions that produce results in both bull and bear markets. 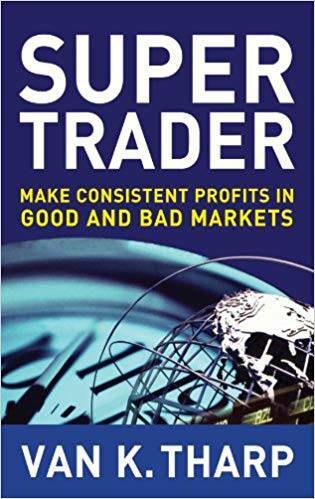 Throughout the book, Tharp asks the pertinent questions you must ask yourself about becoming a trader, being a trader, and succeeding as a trader. The rewards that come with being a Super Trader—both financial and personal—make you feel as if you can leap small buildings in a single bound. Whatever your skill level, Tharp provides the formula for succeeding in a field where most people fail.